Preface This book has been thoroughly revised and updated as per the new scheme and syllabus prescribed by UPSC from 2017 onwards. The interview questions and answers portion has been enlarged to include latest type of interview questions. These have been arranged subject wise. It is hoped that student will find it more useful. From 2017 onwards (Preliminary/Stage I) Examination will have two papers. Papers I (Common for all branches of Engineering) will be based on "General Studies and Engineering Aptitude". Paper II, will be Engineering discipline specific. This book will serve the purpose for clearing Paper II. To cover requirements of Paper I, Author has written separate book on the subject-"General Studies and Engineering Aptitude" It has been written exclusively as per the prescribed syllabus. Although every effort is exercised to make it error free; errors are inevitable in work of this magnitude. I look forward for the constructive comments, suggestions for improvement and corrections, if any. Table of Contents *Important Information *U.P.S.C. Syllabus *Syllabus for GATE Exams. *Fluid Mechanics *Thermodynamics and Heat Transfer *I.C Engines, Refrigeration and Air Conditioning *Turbo Machinery *Power Plant Engineering *Renewable Sources of Energy *Engineering Mechanics *Engineering Materials *Mechanisms and Machines *Design of Machine Elements *Manufacturing, Industrial and Maintenance Engineering *Mechatronics *Model Test Papers *Match the Two Parts *Fill in the Blanks *Solved Papers of Combined Engineering Services and Civil Services Examination from 2006 to 2017. 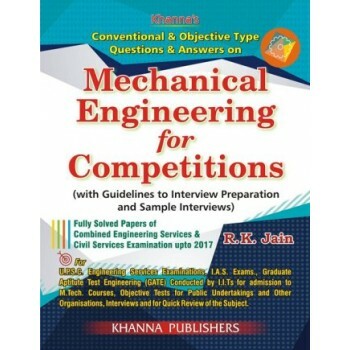 *Interviews *Short Questions with Answers in Mechanical Engineering.